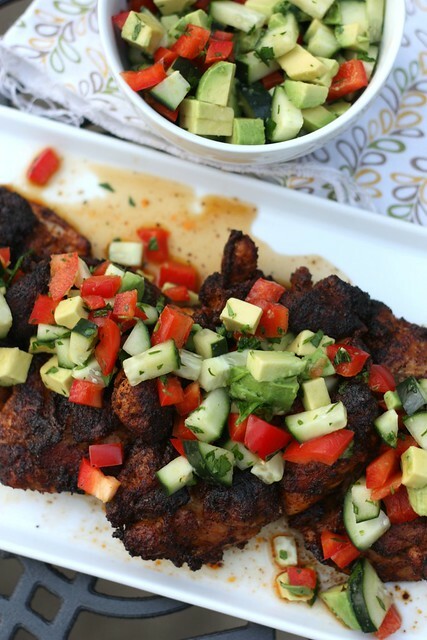 Spicy Chicken Thighs with Cucumber-Avocado Salsa – Elly Says Opa! Today is the first day of the kids’ “summer camp” and I sent them wearing jackets and jeans because it was in the 40s this morning. Happy June? If you’re like us, you probably don’t have to worry *too much* at the moment about meals that don’t take too long to make and heat up the house, but even so, allow me to introduce to you my new obsession: protein + salsa/relish. I have a feeling that, like meatballs, you will be seeing approximately 30 versions of a similar dish in the coming months (okay, maybe not 30, I’ll try to keep it a little interesting around here). These dishes work so well because you can flavor the protein any which way you choose and change up the relish to anything that’s in season, anything that works with the dish, or really anything you feel like eating. We’ve already done a version of this particular salsa with rhubarb and tomorrow we’re potentially throwing a red pepper-hazelnut salsa into the summer rotation. The crisp, cool salsa is decidedly summery, even if the weather isn’t there yet. You can cook the chicken on the grill or indoors and either way it won’t take long. A broiler will get the job done in 8 minutes or so and heats up quickly, so you don’t have to worry about a stifling hot kitchen. The salsa is easy enough to make that you can finish it in those 8 minutes (in the recipe below I’ve had you make it ahead but, let’s be real, I’m way more of a cook-as-I-go- than prep-ahead-kinda gal), which means that, depending on what else you decide to serve this with, you can have dinner on the table in 15 minutes. To make the salsa, whisk the lime juice and honey together in a medium bowl. Add the remaining ingredients and salt and pepper to taste, mixing together lightly. Set aside. To make the chicken, in a small bowl mix together the ancho chile powder, cumin, cayenne, lime zest, salt and pepper. Rub the mixture all over both sides of the chicken thighs. You may grill the chicken or, if cooking indoors, broil or cook it in a pan. To broil, set the oven rack at the top of the oven and heat the broiler to high. Place the chicken on a broiling rack sprayed with cooking oil and broil for about 4-5 minutes per side, until cooked through. If you cook the chicken in a pan, I recommend heating some canola oil in a heavy skillet, like cast iron, just to coat the bottom. Cook the chicken for 4-5 minutes per side until done. 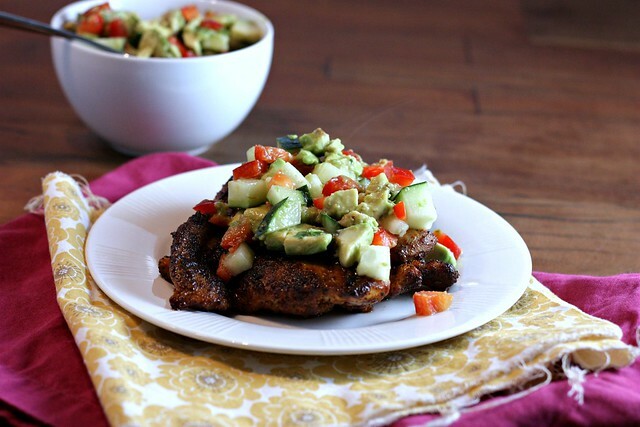 Spoon the cucumber-avocado salsa on top of the chicken before serving. *Note: Ancho chile powder is made solely from ground ancho (dried poblano) chiles. If you are using a commercial chili powder, which contains cumin, I recommend cutting back on the cumin and perhaps increasing the cayenne a bit, if you like spice.